Grade "A" Fancy is the smart New Yorker's guide to smart New York, the foe of the faddish, delivering the big city, distilled and decanted by Karen McBurnie and Jon Hammer. They called it the Spindle City, Cohoes, just north of Albany. In the 1830s textile mills sprouted up here at the confluence of the Mohawk and Hudson. By the middle of the century business was roaring; mills cranking out cottons, percales, wigans, jute, bags and yard goods by the ton. Like so much of upstate economy dependent on the Erie Canal, Cohoes’ industrial heyday is long gone. Now the old mills and worker tenements are apartments and condos. But what are your Grade “A” Fancy correspondents doing so far from our usual NYC beat? Here in sleepy olde time Cohoes there is an unexpected link to the big city, and you will be not at all surprised to learn it resides in a saloon. 171 Remsen Street has been a tavern since the early years of the 20th century. The building dates from 1873 and according to town lore, early tenants included a “silent movie theatre” (more probably a nickelodeon) and a pool hall. 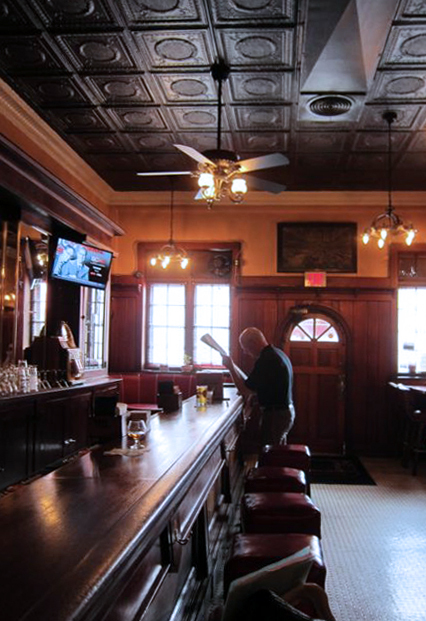 In 1937 the tavern was bought by local political boss Michael T. (Big Mike) Smith. His new venture would become the unofficial headquarters for the Democratic Tammany machine in Cohoes, presided over by Big Mike from a corner booth in the front window. 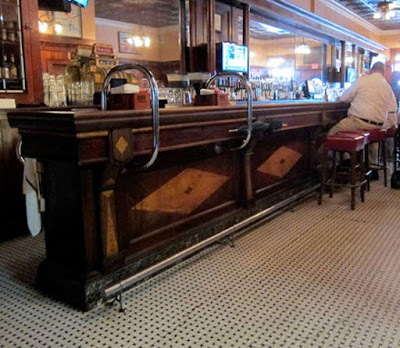 Smith made improvements to the old tavern, including installing the impressive 50-foot-long bar he purchased from the O’Connors, who operated a speakeasy in Albany. The legend was that the O’Connors acquired the bar when the old Tammany Hall in Manhattan closed. But which Tammany Hall? On 17th Street just off Union Square the last Tammany Hall still stands. You can read the inscription "The Society Of Tammany Or Columbian Order" above the door of what is now the Union Square Theatre. However, this was built in 1927, so too late to have housed the Cohoes bar. The first building to be called Tammany Hall was at Nassau and Frankfort, built in 1812 and used until 1867, probably too early for our bar. In 1868 a grand new headquarters was built on 14th Street. The Hall’s political offices were restricted to a single room and the rest was given over to various showmen and entrepreneurs who jammed it full of cafés, oyster bars, minstrel shows, band concerts, opera companies and a bazaar. No doubt that a great bar could have come out of here. Did the O’Connors of Albany salvage the long bar out of the 14th Street Hall when it closed in 1927, and later sell it to Big Mike of Cohoes? We have yet to find hard evidence, but that’s the story, and it’s a good one. 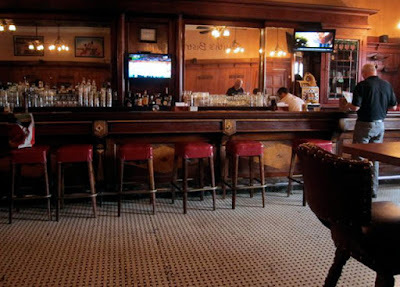 The bar certainly is a splendid slab of mahogany, regardless of pedigree, and its vintage guarantees it has seen many wonders in its long life. 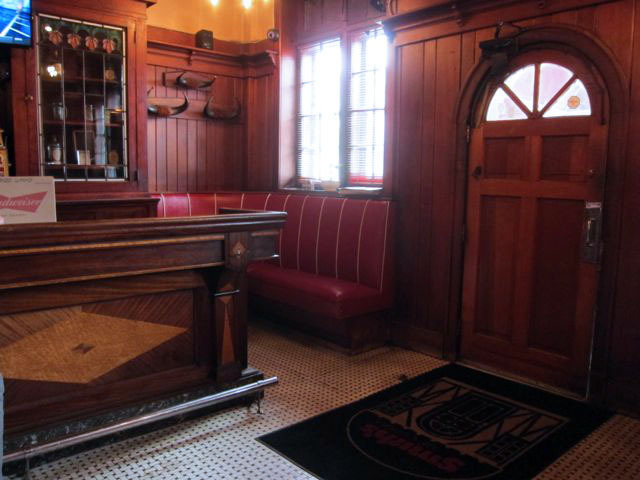 Smith’s today is a lovely tavern with tile floors, red Naugahyde brass-studded barstools, some outstanding circular wood booths, and that long beautiful bar. The backbar has cabinets ornamented with stained glass roses. The food is good, too. 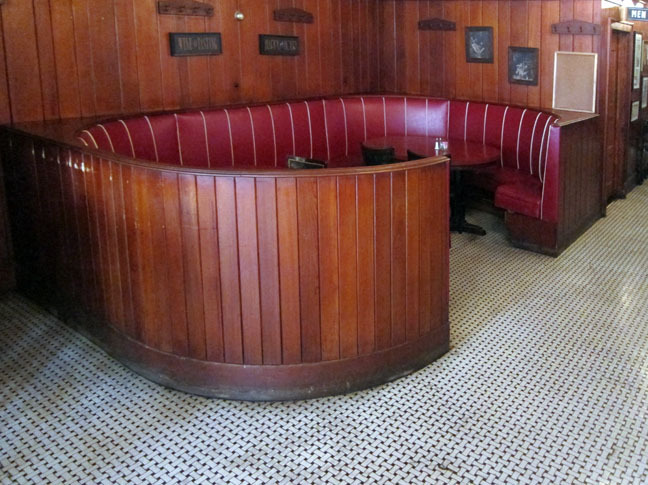 Although Big Mike exited for good in 1949, it’s said his joint on Remsen Street still looks pretty much the same. 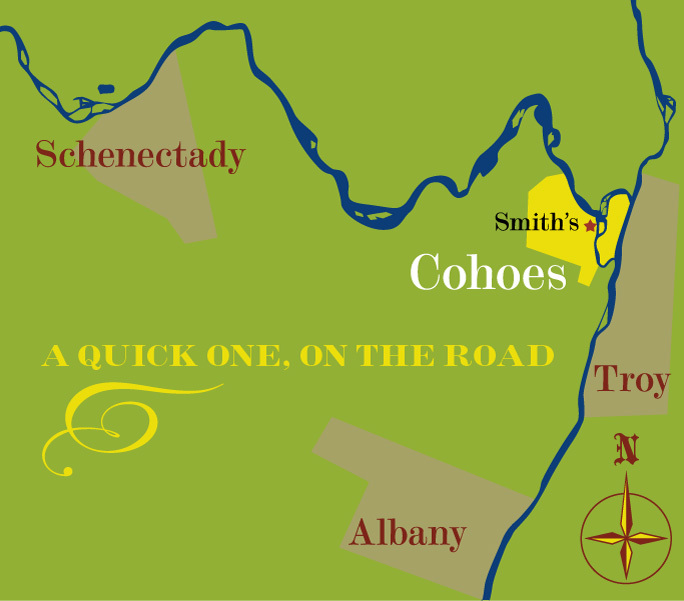 If you are on your way to the Adirondacks, or possibly the races at Saratoga, stop in at Smith's of Cohoes and raise a glass to a far-flung bit of New York City history. Make it Good and Make It Snappy. I Eat Your Restaurant's Brain!